Beginner course Sunday 21st Apr 2019. Great day, Gareth is a superb coach, felt really safe and progressed from complete beginner to being able to tackle some red route terrain with confidence. Really enjoyed the day and really appreciated how Gareth worked at our pace and fitness levels. I cannot recommend highly enough. Thanks Again. On behalf of @theparkkilnwick we would like to highly recommend Gareth as a coach. His session with our youth group (Kilnwick Parklings) held at Dalby Forest was exceptional. Gareth pitched the skills session at exactly the appropriate level and was highly professional. Our teenagers are extremely keen for more sessions with Gareth (and we struggle to find activities that they want to try once, let alone repeatedly)! I did the Progression course at the weekend. It was a fantastic course that covered a lot. Gareth was a great coach and the videos really helped. I definitely finished the day a better rider thank you! Great day with Gareth at Dalby today, I wanted to improve my drop offs but got so much more out of the day. I've came away with loads to work on but achieved much more than I expected to. Highly recommend mission mountain biking to anyone at any level who wants to improve there mountain biking. Awesome day at Dalby forest! Gareth did a tailored course for me and a group of friends, we discussed before what different skills we would like to learn and he designed a bespoke day for us. We all had a really fun day and learnt lots! I'm feeling a lot more confident now and ready to practice my new found skills! If anyone is looking to build their confidence mountain biking Gareth is your man!! I completed a course with Gareth at Dalby yesterday and had such a great time! I'm not experienced at all and there was a variety of skill mix in our group of friends but he had a great balance of making sure we didn't feel pressured and allowing us see our potential! Did things I never thought I could do! It was great to break the skills down on the field then put it into practice on trails. If you're wondering whether to book a course or not.. definitely do it! Learnt so much in a short amount of time, well worth the money. Thanks Gareth!!! Me and a friend recently attended a day-long session with Gareth and couldn't recommend highly enough. Gareth was great in advance and tailored the day exactly as we wanted it to be. We've both ridden for a while but really benefited from the day. Gareth is an awesome coach. Sophie is looking forward to booking her next course. Definitely recommend ! 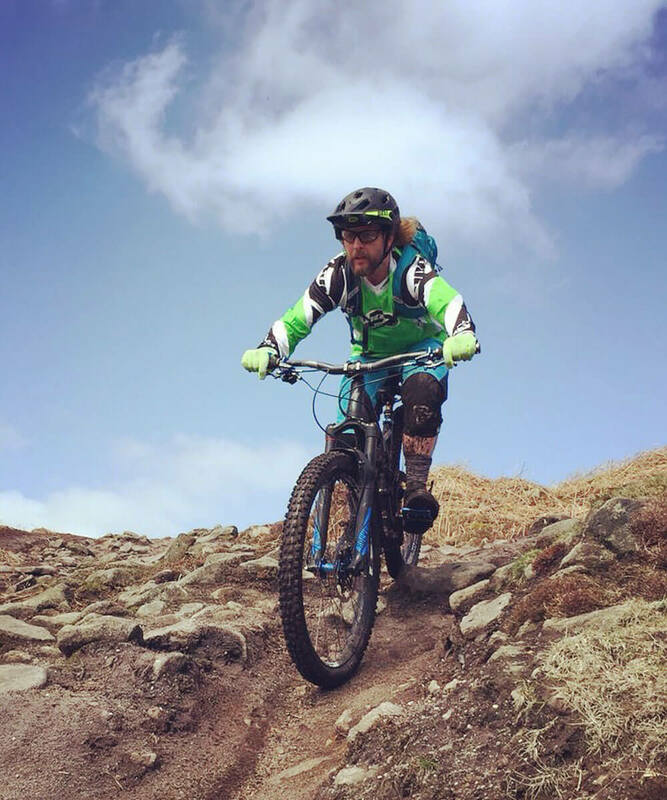 After giving Downhill Mountain biking a go on holiday I was keen to get into MTB further, learn the basics and develop some core skills to give me the confidence to head out on my own and with friends. Gareth’s beginner course, lasting a day in the Dalby forest, was brilliant for this. As a newcomer Gareth was extremely accommodating, patient and encouraging, allowing me to build confidence over the day. He was full of enthusiasm and advice regarding bikes and routes, and having travelled to Dalby with a more experienced MTB friend he was happy to extend his advice and offer tailored courses/trips for the future. All in all a great day out and brilliant value for money! I can't recommend Gareth's coaching enough. I've ridden MTB on and off for years, but I'm always lagging behind at the back and always seem to make hard work of the trail. Gareth took it back to basics, introducing fundamental skills in a nicely planned progression. By the end of the session I was confidently and quickly riding tricky sections and loving it. Gareth loves biking and his enthusiasm rubs off on you. Great coach! Thanks Gareth. If you’re new to mountain biking, you might just want the confidence of having someone who can choose a route to match your fitness and ability, keep you safe and give you some coaching along the way. Experienced riders might just want to save time and use local knowledge to find the very best trails. Whatever your skill level, my goal is to make sure you have a great day’s riding. Discover the best mountain bike riding in the Peak District with a Peak Guided ride. Discover the best mountain bike riding in the North York Moors with a Moors Guided ride. Multi-Day Guided Riding with accommodation. I run guided mountain bike rides at Dalby Forest, The North York Moors, Hamsterley, Stainburn Forest and the Peak District. Mission MTB guided rides are always in small groups (no more than 6 riders per guide). Choose guided rides. Choose big days & big smiles. Get on a mission! I'm happy for Mission Mountain Biking to process my data. Occasionally email me me about MTB stuff I might find interesting. Please take a moment to familiarise yourself with our terms & conditions that apply to our coaching and guiding activities. By making a booking with Mission Mountain Biking you are deemed to accept and adhere to our Terms and Conditions. 1.1. Cancellations by the client before 7 days to the course commencing are refundable minus a 20% administration charge. 1.2. Cancellations by the client within 7 days of the course commencing are non transferable and non refundable. 2.1 In all circumstancesMission Mountain Biking will endeavour to make sure your day goes ahead as planned. In the unforeseen event of a course cancellation Mission Mountain Biking will offer you the choice of a full refund of course fees or an alternative date. 3.1 Names can be changed up to 7 days prior to the course commencing. 3.2 Course dates can be changed up to 7 days prior to the course commencing. 4.1 Payments are made using Stripe’s secure payment system and details will not be retained in our website once the order has been processed. You can choose for Stripe to retain them if you wish. 4.2 We require you to register your Personal Data in order to make a booking so we can contact you should there be a problem with your order. Please ensure you check details provided for accuracy so we can ensure effective communications with you. 5.1 Vouchers can be used on any skills course or private coaching day. 5.2 Vouchers are entered upon booking a course with Mission Mountain Biking and are subject to our terms and conditions. 5.4 Vouchers are subject to verification upon booking. 5.5 Discount codes cannot be used in conjunction with pre purchased vouchers when booking a course. 5.5 Vouchers must be used within 12 months of purchase or they will expire. 6.1 Discount codes can be used on any skills course, voucher or private coaching day. 6.2 Only one code can be used per booking. 6.3 Discount codes are entered upon booking a course with Mission Mountain Biking and are subject to our terms and conditions. 7.1 Mission Mountain Biking accept no liability for personal accident, loss or damage to personal equipment of clientele participating on a course. 7.2 As mountain biking is a hazardous sport. Mission Mountain Biking recommend that all participants take out personal accident insurance. 7.3 Participants take part in courses at their own risk and they must abide by the rules laid down by the instructor at the present time. 8.1 When booking on a course it is your responsibility to make sure you are at the minimum fitness level required stated in the course information area. You are required to read and tick the participant declaration when booking a course. 9.1 Bike – It is your responsibility to make sure your bike is both serviceable and safe, all bikes will be checked by the instructor prior to the course commencing. 9.2 Personal protective equipment – Helmets and gloves must be worn at all times, knee and elbow pads are recommended for more technical courses. 10.1 Mission Mountain Biking provide basic information in order for you to get the venue where your course will take place. It is your responsibility to ensure you get to the venue on time. If you have any doubts about the meeting point, please ensure you contact us prior to the course commencing.